It's hard to go wrong with a shaker card, and it's easy to make a shaker card with the MFT Shaker Window and Frame Die-namics and coordinating plastic window pouches! I chose the Star Shaker Window and Frame, paired with this past month's "free with a $60 purchase" Congrats die-namics. For the "Congrats," I cut three cardstock pieces and glued them together as my base, then cut one layer from Silver Foil Cardstock as the top layer. 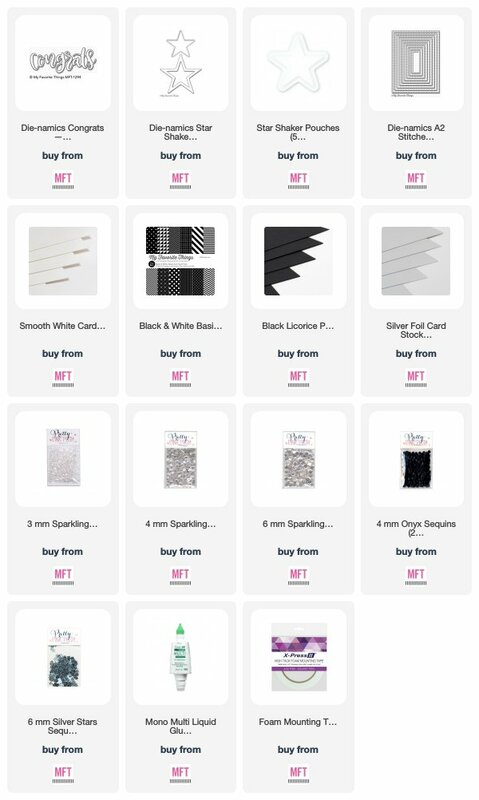 Patterned paper is from the Black and White Basics pad, and sequins were from the packs shown below in the supply list.